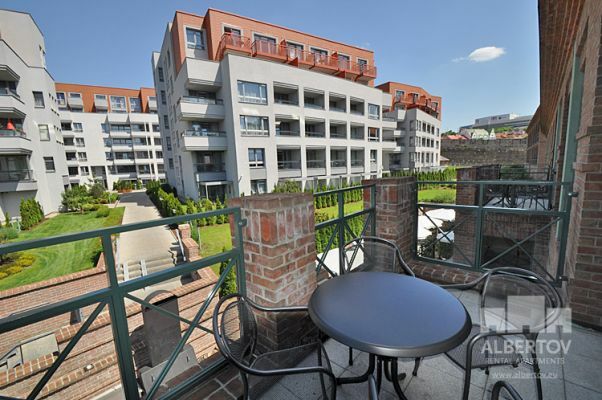 This one bedroom apartment is fully furnished with a balcony and quality furniture. It will make your living cozy and comfortable. 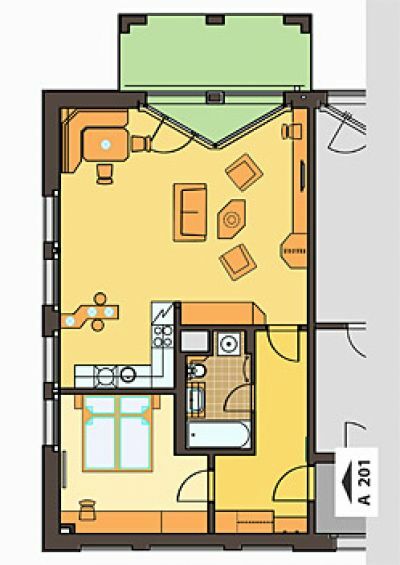 In the apartment you will find one separate bedroom with a king bed, a table for writing and a closet for your clothes. Generously designed living room (40 m2) features a pull out bed size of 160 cm wide, that will be best for your guests. This bed has a quality mattress same as the king bed in the bedroom. In the living room is a pull out sofa where you can relax and also invite more guests. Modern corner kitchen connected with the living room will leave you surprised with its amazing electronic appliances. The exceptionality of this apartment is the bar area and the kitchen table set with the brick lining design. In the spacious bathroom with the toilet and the bath you will find a washing machine and a dryer. For your comfort we added heating to the floors in the bathroom and the living room. So on, there is a satellite television with hundreds of Czech and international programs and a fast connection to the Wi-Fi network. These accommodations are in the price of the rent for this apartment. The orientation of this apartment is east and you can find this apartment on the second floor of the building which is a part of a new, modern and safe area of the sixth building. Located under the Vysehrad Castle, Prague 2.